Emory Saint Joseph's Hospital cardiologist William M. Lieppe, MD, was named the 26th recipient of the hospital's annual E. Napier "Buck" Burson, Jr., MD Physician Award of Distinction. The award is Emory Saint Joseph's highest honor for physician service and is named for the late Burson, a longtime Dunwoody resident, who was a leader in the field of gastroenterology. Lieppe joined the Emory University School of Medicine faculty in 1978 and began practicing full-time at Saint Joseph’s Hospital in 1982. He is a pioneer in the treatment of aortic stenosis using the transcatheter aortic valve replacement (TAVR) procedure, a minimally invasive procedure that allows physicians to place a new valve inside the heart without stopping the heart or opening the chest. Lieppe performed the first TAVR in 2011 at Emory Saint Joseph’s, and this program has experienced considerable growth under his leadership. “Physicians are the core of everything we do and over the past 35 years, Dr. Lieppe has demonstrated his tireless commitment to Emory Saint Joseph’s and patients in our community,” says Heather Dexter, CEO of Emory Saint Joseph’s. Lieppe currently serves as the director of the cardiac catheterization lab and interventional cardiology at Emory Saint Joseph’s, a role he has held for the past decade. 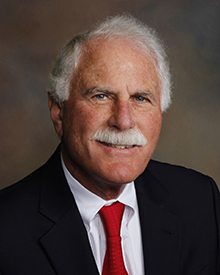 During his distinguished career at the hospital, Lieppe’s additional contributions include service as a member of the hospital’s credentials committee for more than 25 years, and as a member of the Saint Joseph’s Hospital Board of Directors. Prior to his work at Emory Saint Joseph’s, Lieppe worked as the director of the cardiac catheterization lab at Grady Hospital. A native of New York, Lieppe received his undergraduate degree from Yale University and his medical degree from the University of Pennsylvania School of Medicine. He completed his residency at the State University of New York and fellowship at Duke University Medical Center. Lieppe is a fellow in the American College of Cardiology and the American Heart Association. The annual Burson Award is named for E. Napier “Buck” Burson, Jr., MD, a veteran of World War II and recipient of the Bronze Star for his heroic actions on the beaches of Iwo Jima. Burson was the chief of the medical staff for 25 years, leading Saint Joseph’s after its relocation to Sandy Springs in 1978. During his tenure at the hospital, Burson also pioneered the diagnostic tool of GI endoscopy. In addition to the Burson Award ceremony, more than 100 Emory Saint Joseph’s physicians were recognized for their distinguished service to the hospital, ranging from five to 45 years. During the Medical Staff Years of Service Awards, William Silver, MD, was commended for his 45 years in practice as an otolaryngologist.